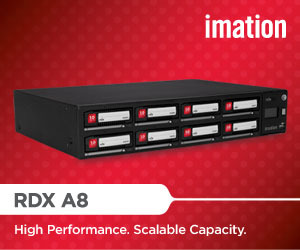 The RDX A8 Storage Library combines the best of the tape and the best of the disk in one appliance. It's an ideal data back-up, protection, retention and restoration solution for small- to medium-sized businesses with enterpriseclass storage needs. Experience the power and simplicity of the RDX A8 Storage Library first hand by taking it for a 30-day test drive! How does the Try-and-Buy program work? • Participating customers receive a new unit, installation support, and customer support for a 30-day trial period. • Participating customers must sign a Try-and-Buy intent to purchase agreement. Which Imation products are included in the Try-and-Buy Program? The RDX A8 Storage Library and two 1 TB cartridges. How quickly can my trial product arrive? After your agreement is approved, the product model will ship within 24 hours. Imation sales engineers and inside sales representatives provide initial installation and configuration support, plus 30 days of evaluation support to address any questions or concerns. How do I participate in the Try-and-Buy program? Contact your BackupWorks.com Rep at 866 801 2944 for more information.